Though painting Uncle Sam as Mrs. Doubtfire, when it comes to the results of government intrusion into the food supply, he’s more like Joseph Mengele. Over the last hundred years, we’ve seen climbing rates of cancer, diabetes, obesity, heart disease and neurological disorders, thanks to Uncle Sam’s “regulation” of food additives and environmental pollutants. We’ve also seen the number of farms decline by 98%. Kerry Trueman of Eating Liberally is only too happy to regurgitate the promotion of government control of food, pointing out when Uncle Sam actually provides a social safety net, to wit: the SNAP program, otherwise known as food stamps. She fails to mention that 184 House Democrats (along with 217 Republicans) just voted to make deep cuts in US food assistance in the 2012 Agricultural Appropriations bill (HR 2112), which I summarized here, based on the analysis of several different experts, and my own stumbling thru the massive bill. One piece I relied on, by Congressmen Sam Farr and Norman Dicks, points out that though the Women, Infants and Children program got a slight boost, the $6 billion budget nowhere near meets the needs of the 50 million+ US citizens who live in poverty, most of them women and children. That’s less than $150 per year for each hungry person. But, hey, how about those foreign resource wars that Uncle Sam funds to the tune of $1.2 trillion? Two years ago, the estimate of those in poverty reached 47 million. Since then, unemployment has boomed while the number of jobs has declined. You do the math; I’m sure the number of those truly living in poverty is much higher than 50 million, though recent government figures assert that the number in poverty hovers at 40 million. “Funding for the Commodity Supplemental Food Program, which serves predominantly low-income seniors, is $138.5 million. This is $38 million (22%) below the 2012 request and $37 million (21%) below 2011. “Funding for the Emergency Food Assistance Program (TEFAP), which works with states to assist food banks, is $38 million. This is $12 million (24%) below the 2012 request, and about $11 million (23%) below 2011. The bill also cuts $51 million (20%) from the funding that TEFAP receives annually from the SNAP program. Trueman does acknowledge that Big Ag’s lobby has twisted Uncle Sam’s arm to the detriment of the public, but fails to acknowledge that the Obama Administration is well known for appointing those lobbyists to key positions. * Obama appointed biotech poster boy Tom Vilsack as head of the USDA, who’s been sued twice so far for violating law by approving genetically modified crops without proper environmental assessments. * He made Monsanto lobbyist and pesticide-pusher Islam Siddiqui the US Ag Trade Representative. * Obama also put Elena Kagan on the US Supreme Court. In the No-GMO world, she is most notorious for her government-funded support of Monsanto when she served as Solicitor General. Speaking of the “economics of our food supply,” which the exhibit touts, the new ag appropriations bill also made deep cuts to local and regional food system development programs. Agribusiness giants dominate the market today. This is Uncle Sam setting US priorities. The Senate is now reviewing HR 2112. Really? Mrs. Doubtfire? The FSMA promises to enforce irradiated foods, promote genetic engineering, and run out of business small and midsize operators on which we’ve thrived for hundreds of years. Burdensome hyper-regulation will force them to upgrade their facilities to the tune of tens of thousands of dollars or lose their license. A veritable Big Food dream, and an Oliver Twist nightmare. “Safety” has nothing to do with the FSMA – this is about forcing us to eat factory-produced foods adulterated with GMOs, chemicals, drugs and nanomaterials, where most of the nutrition has been removed. It’s really a nice racket – for the medical profession, pharmaceutical industry, and chemical manufacturers, as well as Big Ag. Like all the “modernization” acts, the Food Safety Modernization Act is but another in a long line designed to enhance profits of Big Business at the expense and health of the rest of us, including the environment. Commodity Futures Modernization Act of 2000 also deregulated Wall Street, allowing for credit default swaps, unlimited trading in food commodities futures, and the infamous “Enron loophole,” which benefited (among others) the wife of the congressman who authored it: Phil Gramm. Farr and Dicks also point out that the 2012 ag appropriations bill defunds the Dodd-Frank financial reform legislation that seeks to rein in food commodities trading. This would bring food prices down, but the House defunded it in HR 2112. Frederick Kaufman’s The Food Bubble: How Wall Street starved millions and got away with it. Voter Registration Modernization Act of 2009 didn’t pass, but don’t ignore it. This bill seeks to set up online voting, another ludicrous assault on democracy. There is no way to ensure these votes are valid. Oh, we’re seeing that. Not only has the FDA increased its raids on natural food producers and sellers, but (as many readers know), it also recently claimed authority under the FSMA to seize food without credible evidence it’s been contaminated. When you think about what’s in 90% of US food, the risk of becoming ill from natural foods and supplements is far, far below what’s happening to the majority of Americans, with climbing rates of diabetes, obesity, heart disease and neurological disorders. Yet natural food producers are under attack by Uncle Sam given his commitment to global trade rules. This isn’t Mrs. Doubtfire or Mary Poppins. This is Adolph Hitler, Benito Mussolini and Josef Stalin all rolled up into one. This isn’t a nanny state; this is food fascism – criminalizing our right to eat the foods of our choice, grown and prepared as we like, while destroying the ability of family and mid-size farms to earn a living. 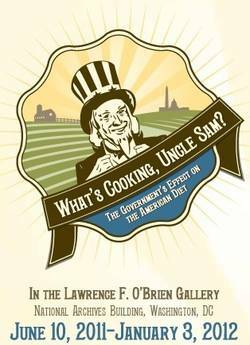 I’m sure the “What’s Cooking, Uncle Sam” exhibit will provide a fascinating study – not into enhanced food safety or increased health invoked by federal policy, because that clearly has not happened – but in the power of propaganda. Bob Koehler says these types of efforts “abandon us in a state of feel-good pseudo-security.” Despite that, and you can blame this on morbid curiosity, I hope to see it. What’s Cooking is on display thru January 3, 2012.